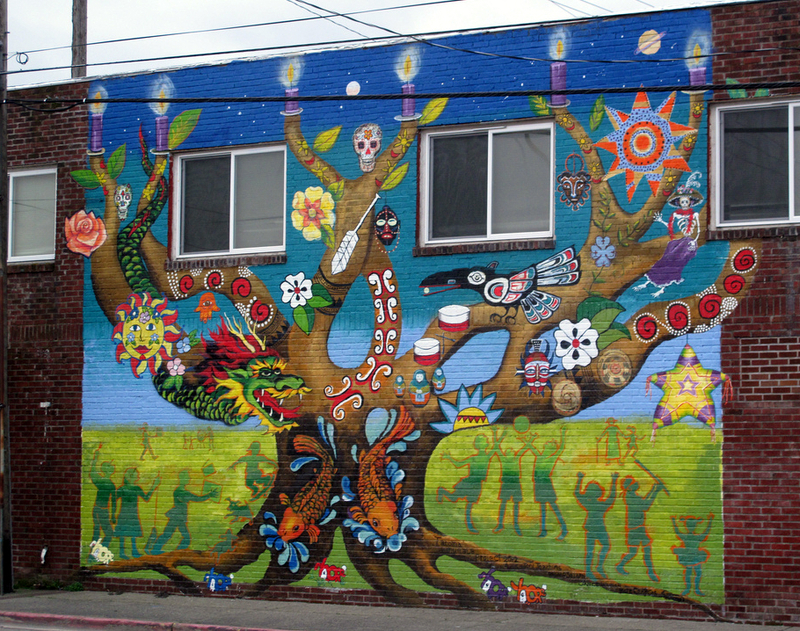 Although the building’s address is on McKinley, the mural fronts on 63rd. The brick building was constructed in 1925 and was owner occupied by the Grote Pharmacy, which included a U.S. Postal Substation. More recently it was occupied by A. A. Wedding Supplies, but it is now vacant (at least the lower level) and available for rent. This entry was posted in Art -- there is art here!, Tacoma, Their future is in question, WA State - Pierce County and tagged A.A. Wedding Supplies, Brian Hutcheson, brick, Chelsea O'Sullivan, dragon, fish, Grote Pharmacy, Hope Heights, Janice Lee Warren, Joni Joachims and artists Yvette Simone, Kate Cendejas, McKinley, mural, raven, skulls, Tacoma mural Project, tree on February 9, 2013 by admin.